Students expect the first day of school to be unproductive. They walk from one room to the next, playing icebreaker games and collecting printed copies of guidelines and expectations. The first day is either a social event or a logistics meeting. It makes sense to have the class get to know one another and understand the rules, but there is a better way to kick off the year. Rather than focusing on the personalities in the room or classroom policies, why not get them engaged in learning? Teachers start the year excited about the ideas they will teach, but students often have little understanding of what the class is about. 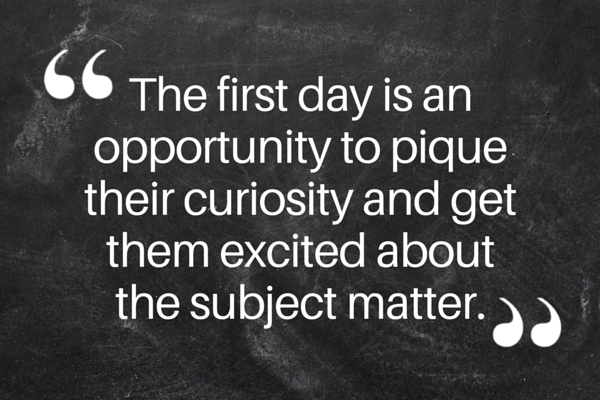 The first day is an opportunity to pique their curiosity and get them excited about the subject matter. Every class has some big question that guides it through the year. The question is often deceptively simple and open to discussion. Math teachers might ask students about problem-solving and logic. Psychology teachers could ask their students whether humans have free will or whether their actions are determined by patterns in their thinking. Regardless of the subject matter, there is some underlying idea that guides the purpose and structure of the class. Once you have your big question for the year, create a situation that will get students to think critically and discuss the topic. Have your history students break into groups and decide what events from this year should be covered in textbooks of the future. Surprise students with a poem from the Victorian period that is silly or otherwise breaks their preconceived notions of old, boring texts. Give math students a complex, intriguing problem and have them work together to solve it. Have science students set up an experiment to test a hypothesis. Get to know the personalities in the room by having students share their ideas. Create relationships among the students by asking them to respond to one another and work together as they dig into the major ideas of the class. This accomplishes the same goals as the traditional icebreaker, but it puts the social interactions within the context of the academic work. The first day should get students excited about the things they will learn. Rules and expectations are a means to facilitate that process, but they are a means to an end. No student is going to be excited by a handout with a list of rules. If you use your first day to get your students engaged in the topic of the class, you can then present the rules as a way to explore the ideas they care about. Do you have any first day tips? Share them below!